Hitman 2 fans already have a lot to look forward to throughout April, including a major Ghost Mode update. However, that’s just the start of developer Io Interactive’s ambitious 2019 content plans. 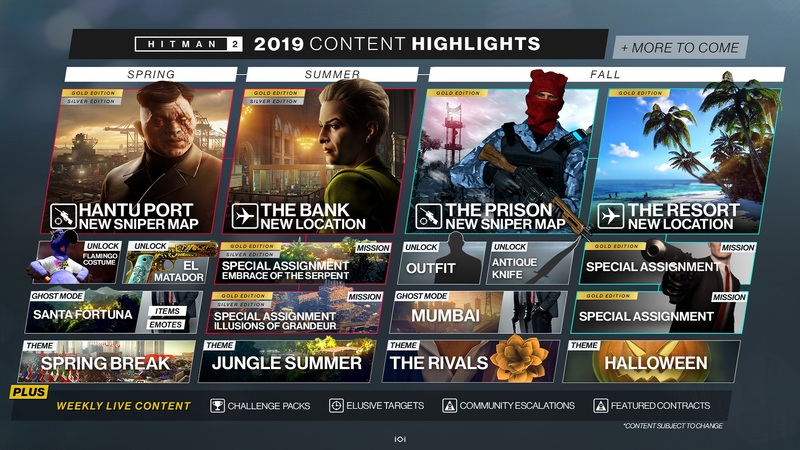 In a recent post on its website, Io outlined everything Hitman 2 fans can expect throughout 2019.
map, the aforementioned Ghost Mode update, and more. Targets, challenge packs, Featured Contracts, Escalation Contracts, and more. Lastly, Io also teased new weekly live content additions which it will share more about soon. The studio also remains committed to hosting monthly developer livestreams and releasing monthly updates which providing balancing changes and fixes. Meanwhile, fans are already dreaming up what they’d like to see in Hitman 3. Though, given Io’s extensive Hitman 2 roadmap, it sounds like those fans have got a long wait ahead of them. The post Hitman 2: Io Interactive Outlines All Major 2019 Content Additions appeared first on VGR.